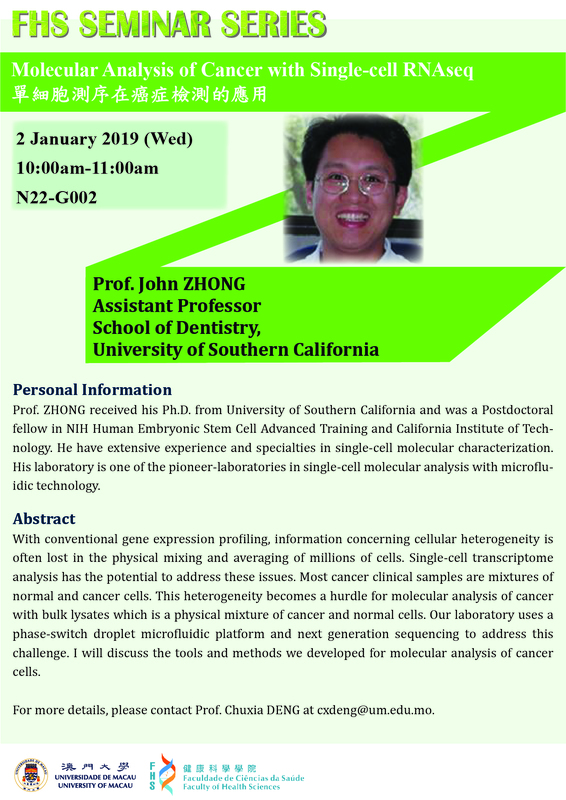 Prof. ZHONG received his Ph.D. from University of Southern California and was a Postdoctoral fellow in NIH Human Embryonic Stem Cell Advanced Training and California Institute of Technology. He have extensive experience and specialties in single-cell molecular characterization. His laboratory is one of the pioneer-laboratories in single-cell molecular analysis with microfluidic technology. With conventional gene expression profiling, information concerning cellular heterogeneity is often lost in the physical mixing and averaging of millions of cells. Single-cell transcriptome analysis has the potential to address these issues. Most cancer clinical samples are mixtures of normal and cancer cells. This heterogeneity becomes a hurdle for molecular analysis of cancer with bulk lysates which is a physical mixture of cancer and normal cells. Our laboratory uses a phase-switch droplet microfluidic platform and next generation sequencing to address this challenge. I will discuss the tools and methods we developed for molecular analysis of cancer cells. 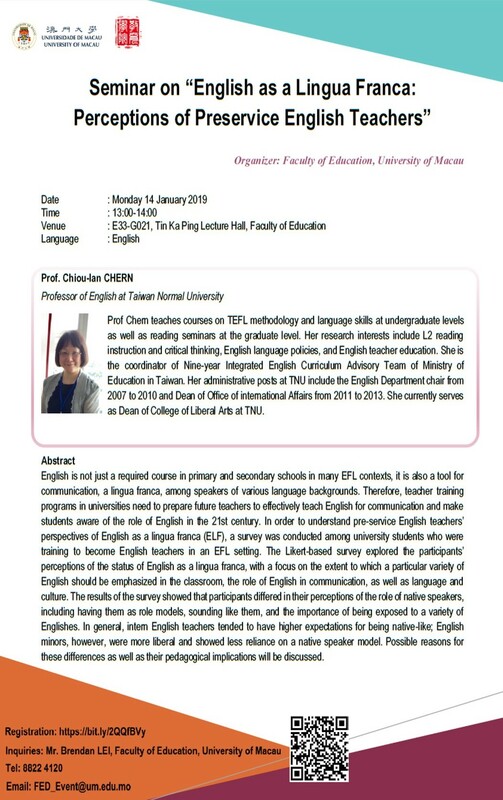 For more details, please contact Prof. Chuxia DENG at cxdeng@um.edu.mo. Content Spexin (SPX), a neuropeptide with pleiotropic functions, has been identified as a satiety factor in fish models. In our recent study with goldfish, insulin was confirmed to be a functional link between food intake and SPX expression in the liver and IGF-I receptor (IGF1R) together with insulin receptor (InsR) were found to be involved in insulin-induced SPX expression at the hepatic level, which raises the possibility that the hepatic signal of insulin-like growth factor (IGF) induced by growth hormone (GH) may play a role in SPX regulation. In this study, food intake in goldfish was found to up-regulate plasma levels of insulin, SPX and GH with parallel rises of GH mRNA in the pituitary and transcript expression of SPX, IGF-I and IGF-II in the liver. In goldfish pituitary cells, insulin treatment could induce GH secretion without notable changes in GH mRNA expression. In goldfish hepatocytes, GH induction could increase SPX, IGF-I and IGF-II gene expression via activation of JAK2/STAT5, MEK1/2/ERK1/2 and PI3K/Akt pathways and these stimulatory effects were blocked by inhibiting InsR and IGF1R activation. Interestingly, parallel treatment with insulin was shown to up-regulate IGF-I with concurrent inhibition on IGF-II mRNA expression and these differential effects were mediated by PI3K/ Akt but not MAPK cascades. Meanwhile, insulin-induced IGF-I gene expression was additive to the corresponding stimulation by GH but the parallel rise of IGF-II mRNA induced by GH could be suppressed by insulin co-treatment. At hepatocyte level, IGF-I and IGF-II were both effective in stimulating SPX mRNA expression mainly through InsR, and to a lesser extent via IGF1R, by functional coupling to P38 MAPK and PI3K/Akt pathways. These results, as a whole, indicate that insulin can induce SPX expression in goldfish liver via indirect action of GH/IGF axis and local production of IGF-I/-II. Since insulin signal triggered by feeding is known to be transient mainly due to the signal termination by glucose homeostasis, the IGF-I/-II expression at hepatic level may play a role in prolonging/maintaining the SPX responses after food intake in fish model. 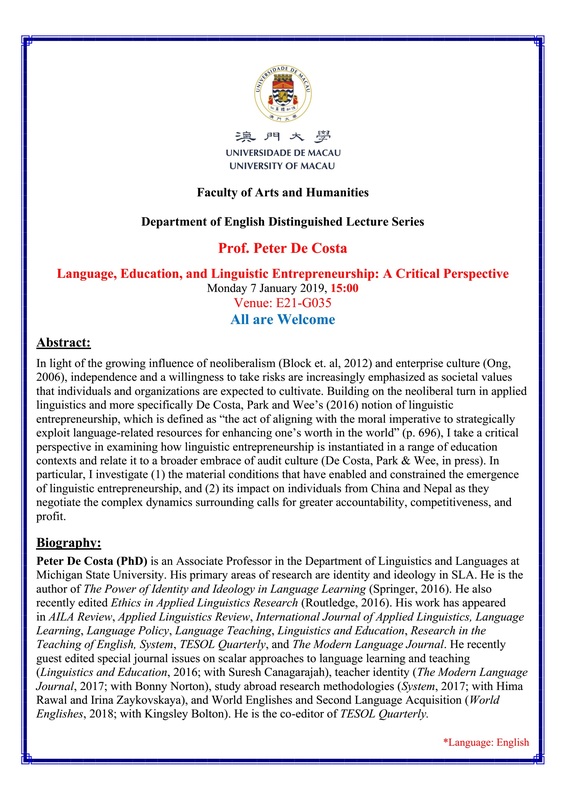 For more details, please contact Prof. Wei GE at weige@um.edu.mo. 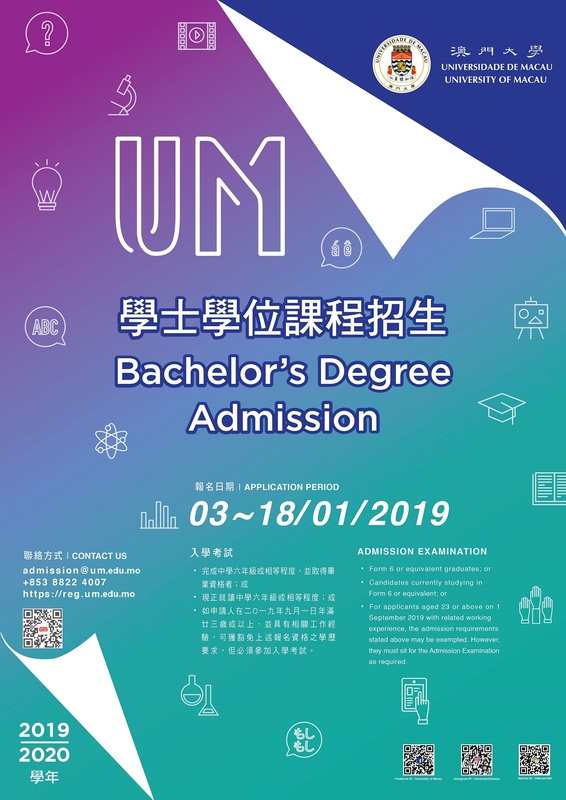 Content Admission Rules and Online Application are available on the Registry's website at https://reg.um.edu.mo/admission/ during application period. Organizer State Key Laboratory of Internet of Things for Smart City (University of Macau), Companhia de Electricidade de Macau - CEM, S.A.
Target Audience All local engineers, researchers and students. 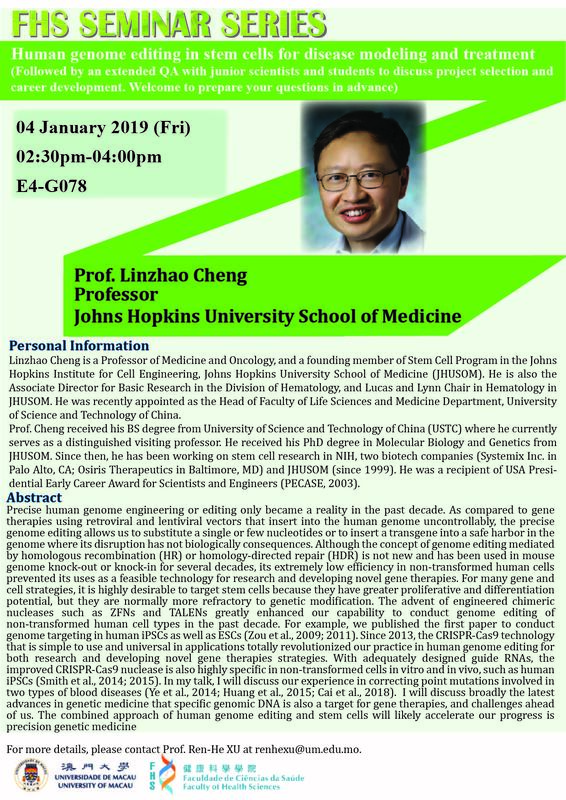 Linzhao Cheng is a Professor of Medicine and Oncology, and a founding member of Stem Cell Program in the Johns Hopkins Institute for Cell Engineering, Johns Hopkins University School of Medicine (JHUSOM). He is also the Associate Director for Basic Research in the Division of Hematology, and Lucas and Lynn Chair in Hematology in JHUSOM. He was recently appointed as the Head of Faculty of Life Sciences and Medicine Department, University of Science and Technology of China. 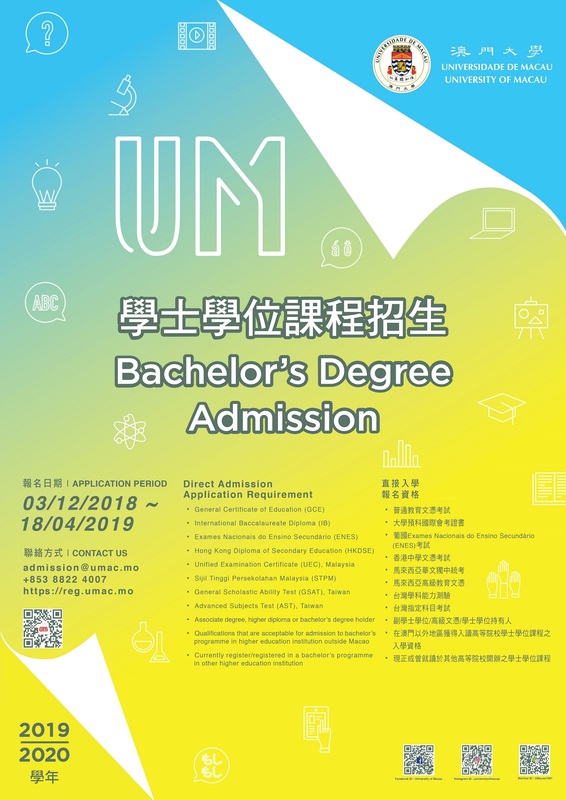 Prof. Cheng received his BS degree from University of Science and Technology of China (USTC) where he currently serves as a distinguished visiting professor. He received his PhD degree in Molecular Biology and Genetics from JHUSOM. Since then, he has been working on stem cell research in NIH, two biotech companies (Systemix Inc. in Palo Alto, CA; Osiris Therapeutics in Baltimore, MD) and JHUSOM (since 1999). He was a recipient of USA Presidential Early Career Award for Scientists and Engineers (PECASE, 2003). 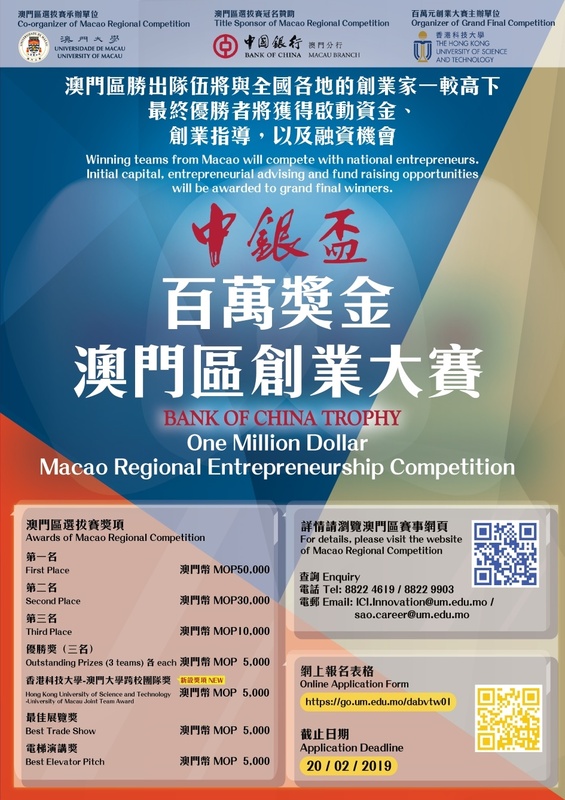 For more details, please contact Prof. Ren-He XU at renhexu@um.edu.mo. 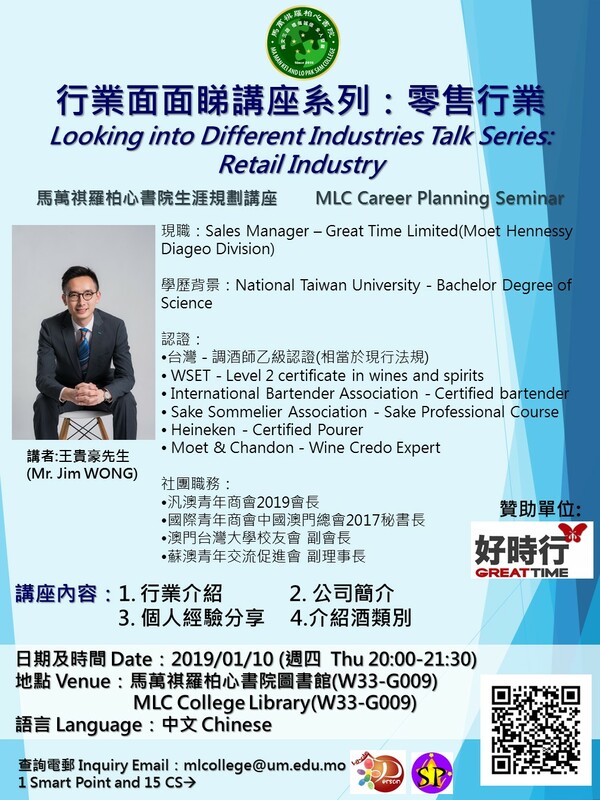 Content MLC has invited Mr. Jim Wong to share the inside story of the retail industry, he will also share the his experience as a sales manager and introduce different types of wines. Join us if you are interested in the below topics. Remarks: 1 Smart Point and 15 CS will be awarded to students who participated the whole activity.